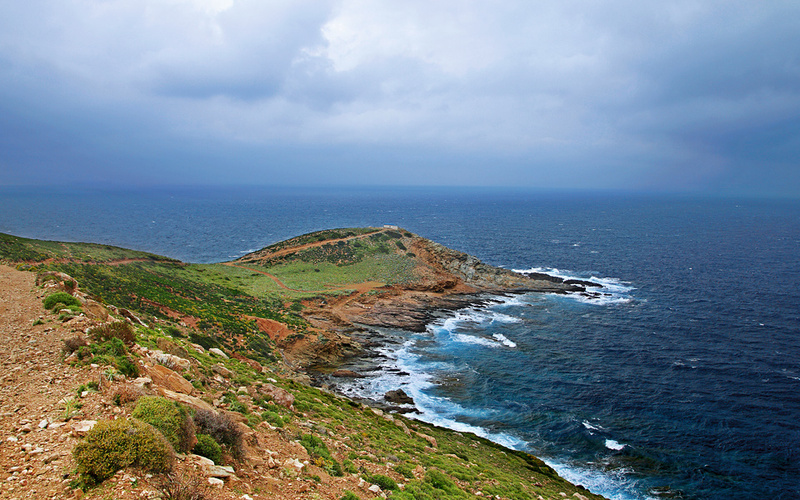 Cavo d'Oro, or Cape Kafireas, is the southernmost tip of the island of Evia. A surprising 60km journey across the legendary cape, with its isolated villages, incredible trails, untouched beaches, stunning gorges and mysterious 'dragon-houses'. “It makes a racket [doros in Greek], that’s why they call it that.” That is the unofficial explanation for the name of the legendary cape – known as ‘Kavo Doro‘ in Greek – that the locals offer visitors. The other, official version – and the one that is more likely closer to the truth – is that it comes from the Italian Cavo d’ Oro, which means ‘Cape of Gold’, with the name arising due to the gold coins that are said to litter the surrounding seabed from the countless shipwrecks that have occurred in the area since ancient times. Another explanation is that the name, perhaps, comes from the mines that were discovered by ancient Phoenician seafaring gold-seekers. Sailors have long feared the waters around the cape and with good reason: the Kafireas Strait between Evia and Andros is considered one of the most dangerous passages in the Aegean. Of course the area poses far less risk to modern vessels (although the frequently rough seas remain as difficult as ever for those susceptible to seasickness). Curiously though, (by Greek standards) there is not a single church in the area dedicated to Agios Nicholas, the patron saint of seafarers. Perhaps the locals did not want to embarrass the saint who, despite his holiness, is no match for the incessant winds. Cavo d’Oro, or Cape Kafireas is located 60km from the town of Karystos. It’s an enchanting journey down to the southernmost tip of the island of Evia which, while perhaps not the end of the Earth, certainly feels that way. Once you pass Platanisto, it is like being transported to a different land, with different weather, different images, and a different feel. A whole different way of thinking. “We are not included on the map,” says Maria Kefala from Andia. Geographically located right in the center of Greece, it is an oddity. But at the same time utterly real. It was only in the 1980s, in any case, that electricity finally made it to the villages of Kafireas. Our route meanders through the foothills of the Ohi mountain range where, according to myth, Zeus and Hera once embraced. 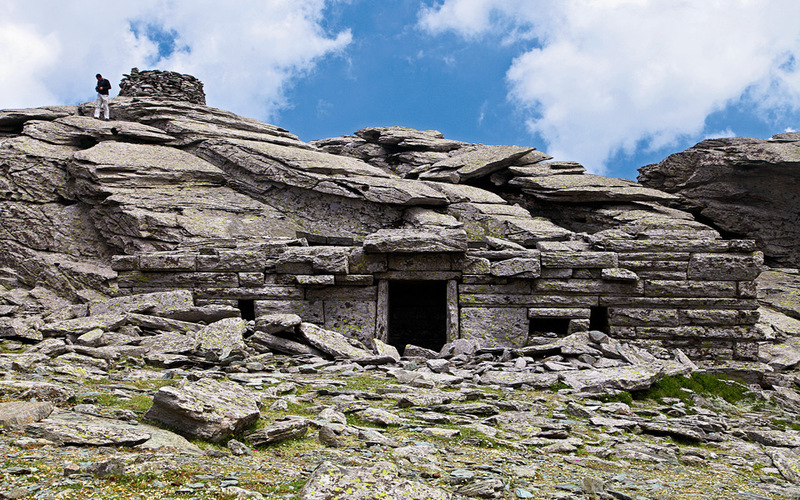 Further up is the mountain’s famous drakospito (literally ‘dragon-house’), a curious and ancient stone construction that was likely once a temple. Similar such buildings exist in other areas in southern Evia. A mysterious fog may envelope Ohi even in late spring, while all around are rocky slopes cascading into the sea, wind generators, wild goats grazing in the salty air, wild herbs and, every now and then, lush green gorges that lead down to incredible beaches. Trees here are scattered and stand alone, always lean in the direction of the prevailing wind. In spite of the legends, the locals cast their nets in these waters and hope to make a living.“Don’t get me wrong… It keeps us on land more often than not. But once you get out, you get work done. It’s a good fishing area,” says 20-year-old Dimitris Koundasis from Amygdalia. He does everything: beehives, animals, agricultural work…“If you don’t do everything you can’t make it here. But I am preparing to leave.” And no matter what you tell him, he won’t change his mind. In the village there are another two people his age. Four children and another two from Prinia make up the local school. Thirty residents in total. It could be worse as it is the most densely populated village in the area. Zaharia is deserted while Kapsouri has 2-3 people. A 1990 census found that the entire area had 500 souls. The mailman comes every Monday while the ‘bread-woman’ arrives every Saturday. She goes from village to village with bread for the entire week. “May she be well. In the past we didn’t need her as we would make it ourselves, but, now, why would you fire up an entire wood oven for one loaf?” asks Georgia Giannakari in Andia. She has a point. Until a few years ago the dirt road began in Platanisto, the informal boundary with ‘civilization’ 20km from Karystos. Now the asphalt reaches the village of Zaharia, 32 km from Platanisto, but you still need a 4×4 to navigate the 10km of dirt road to Kafireas. From there if you continue north towards Kalliano and Agios Dimitrios there is another 15km of rugged dirt track which, in the winter, is impassable by any vehicle. Six kilometers after the village of Metohi, you can take the first detour. The pleasant uphill route (paved with cement at the beginning before becoming a dirt track) leads to the famous Kastanologgo with its ancient chestnut trees – true natural sculptures – that cover an area of 60 hectares. 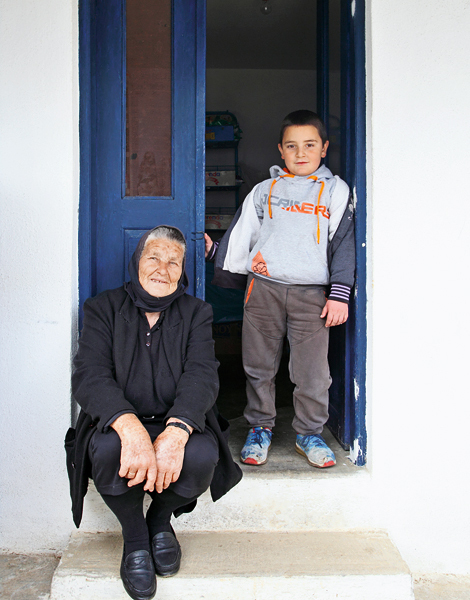 They are among the oldest in Greece and the only remnants of the chestnut forests that once covered all of Evia. Signposts direct you to the Ohi climbers’ shelter and from there a 1- 1.5 hour trail begins for the mountain’s peak, a fantastic yet tiring hike which ends at the small church of Profitis Ilias and the Drakospito, the largest and most imposing of its kind in Greece. Scholars have still not settled the question of who built these ‘dragon-houses’ or what purpose they served. Were they places of worship, stables, housing for ancient quarrymen? Perhaps all of the above. In any case, with their enormous stone blocks and sophisticated construction without the use of a binding material, it is unsurprising that the laity attributed them to the work of dragons. Further down, the route continues to the village of Platanisto and the aforementioned boundary. Whoever said that southern Evia is dry and barren is emphatically disproven. Green abounds on all sides, punctuated by running water. A place for fairies and nymphs. At the entrance of the village, a short path leads to a stone bridge built in 1880, the so-called ‘Artino’. At its exit, the water tumbles from a height of 6-8 meters to form a waterfall. At the Panohori, or upper village, which you reach via a narrow concrete road, you encounter the second stone bridge, the watermill and springs. 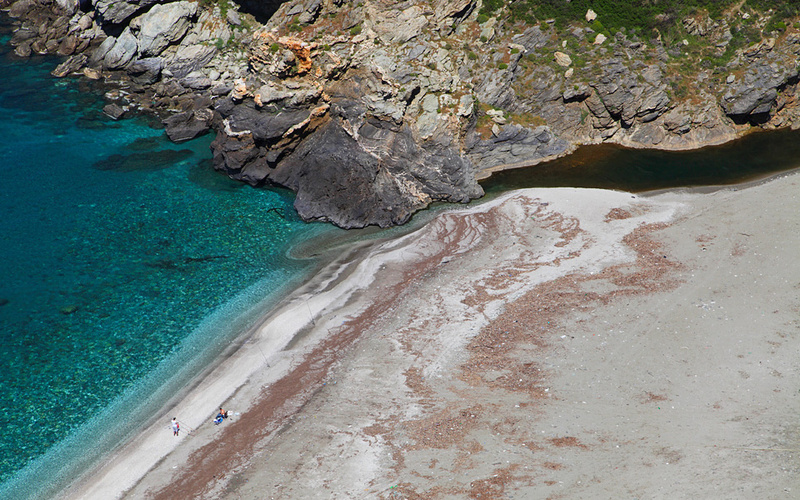 If you want you can continue downhill to the Potami beach, where the stream meets the sea. During the summer, however, you will not be alone. The secret is out and there are tents pitched by the stream, a few rooms, two small tavernas and a canteen. Gradually, encounters on the road become more infrequent. From Platanisto and on you will encounter only sheep, sheepdogs, donkeys, horses… The area is fragrant with wild thyme and oregano. Rather than human voices, all you will hear here is the sound of the wind and sea. 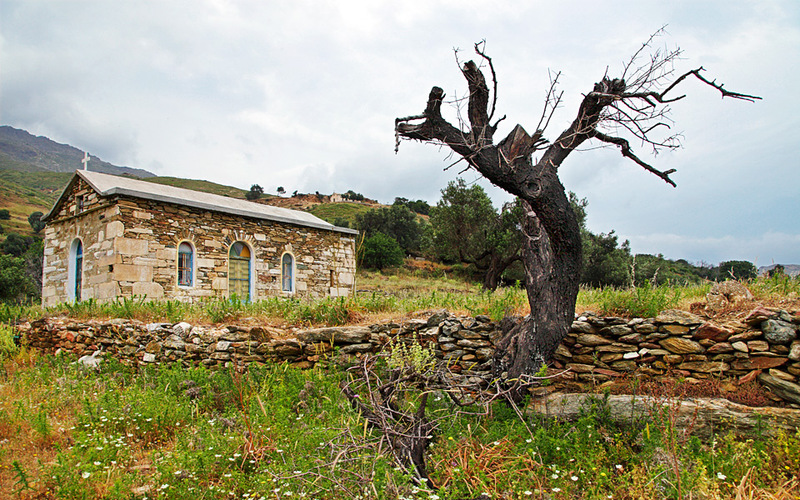 In Andia you’ll find 35 people telling stories in the cafe of Maria Kefala. 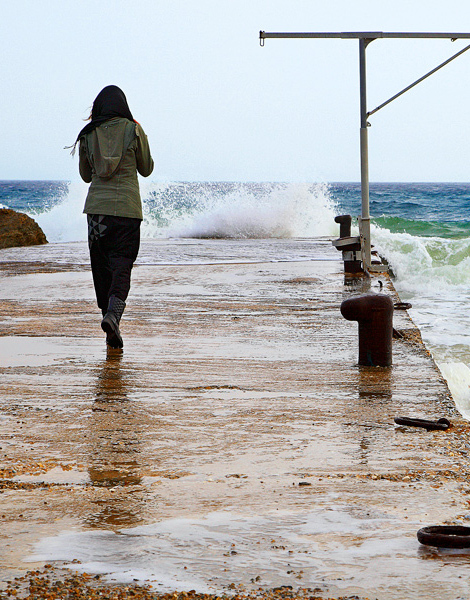 Her father, the local legend Panayiotis Kefalas passed away eight years ago, but she keeps the cafe open standing stubbornly against the tide of time. “Only a few of us are left but I open it. It is a habit. I’ve been in here since I was a little girl. And if someone passes by, he can find something to eat” she says. I asked her where a passerby will stay given there are no rooms. “Oh! There are beds, they are all empty!” she says and begins joking with the neighbor, Ms Georgia who is among the very few left that know the ‘sfyries’, the famous whistles of Andia. These ‘sfyries‘ are not a game, nor a code. They form a bona-fide language, complete with letters, syllables and even intonation, as researchers have discovered. Unique in Greece and rare worldwide (a similar system has been found in a village in Turkey, in the Canary Islands and in the Pyrenees) it is said to have been created out of the need for people to communicate over large distances – in this case across the slopes of the mountain. Komito forms the boundary between the Evians and the Arvanites who moved to Cava d’Oro in Byzantine times and during Ottoman rule. You would be considered lucky to find a single person living in the villages of Evangelismos, Kapsouri, Dryomonari, Thymi, Zaharia, Amygdalia, Vrestides, Prinia. Between Komito and Kapsouri is the gorge of Arhabolis, a verdant strip which ends on the eponymous beach. Even if you visit in the height of summer in August, you will be alone with the seagulls; and perhaps a few campers, who keep the secret closely guarded. The path begins from the village Thymi and the descent beneath the imposing rock face takes about an hour. An ancient city has been discovered there, but the most one can make out are its outer walls. Keeping to the right after Amygdalia at every crossroads, you reach Prinia. If you head to the left here you will emerge on a dirt road over the stunning cliffs of the eastern coast, with a view of the entire cape. From Agatho the road is paved and from there you can easily reach the village and beach of Kallianou. 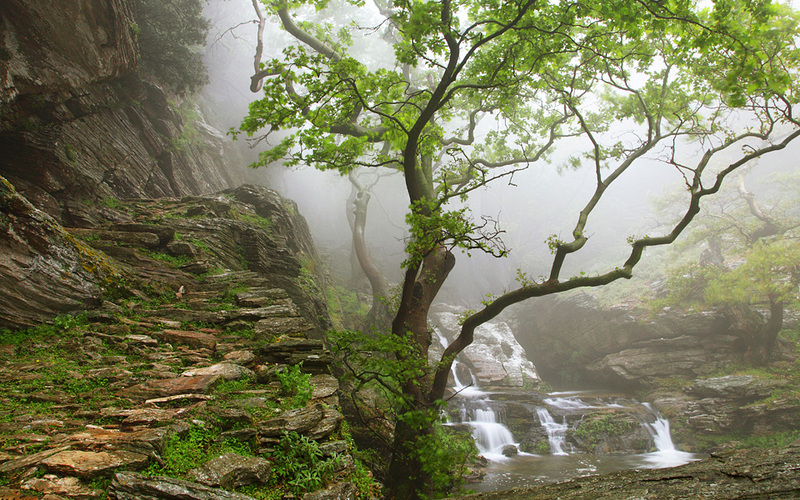 This is where the famous gorge of Dimosaris ends, and it worth hiking at least once in your life. The stunning route, through the lush vegetation begins from Petrokanalo on Ohi, takes 4-5 hours, passes by watermills, waterfalls, rock-pools and makes use of the once-famous Skala Lenosaion, the old cobbled path which linked Cavo d’Oro with Karysto, before the road was built. Next to Kallianou is the beach of Agios Dimitrios. These were also once unknown. Now in the summer many people arrive here, as an asphalt road now links the area with the main Maramari – Karystos road and those towns. But our focus is the cape. So back to Prinia you once again bear right and enter the narrow, rugged dirt road which, despite being only 3km-long, seems never ending. Cape Kafireas, the ship-eater, appears in front of you bearing centuries worth of legends. The church of Agios Grigoris battles to expel any evil that may linger and Arapis, the rock with the lighthouse, is continually pounded by the waves seven nautical miles from the coast of Andros. There is nothing to see here, only to feel. That’s why how long you will stay depends on your temperament. And about what, of course, you have come to confide in the wind. The main road Halkida – Karystos (120km plus 75k from Athens to Halkida) is in exceptionally poor condition for a main national road. An alternate option are the ferries which depart from Rafina about three times a day and take you to the nearby town of Marmari in one hour (tel: +30 229.4023.561, nine euros per person, 21 euros for a car). There are no gas stations on the cape so make sure to fill up in Karystos.